In order to effectively use ActiveMQ, it is very important to understand how ActiveMQ manages memory and disk resources to handle non-persistent and persistent messages. 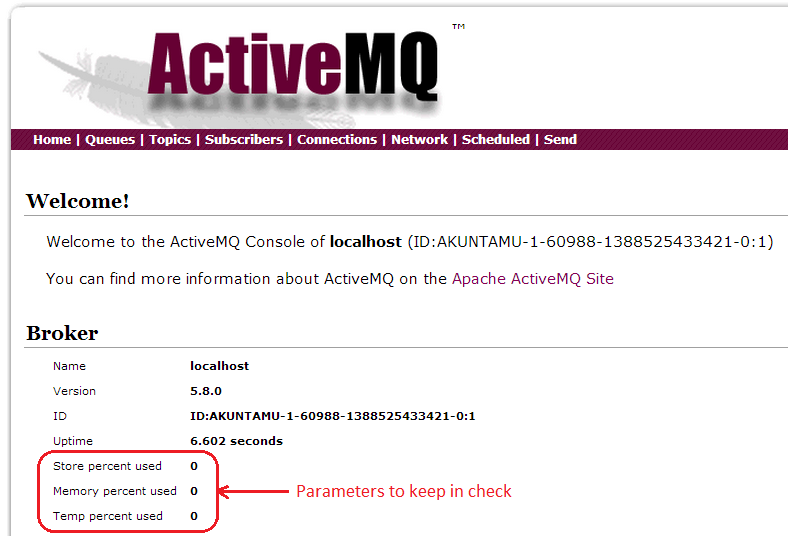 ActiveMQ has three key parameters which need to be kept under check. This blog attempts to clarify how store,temp and memory % usage of a single node ActiveMQ broker instance are calculated. We are using ActiveMQ version 5.8.0 for this explanation. Once we gain clarity on how ActiveMQ operates these values, we can fine tune ActiveMQ using key configuration settings in order to handle the following use cases. This is huge issue when consumers are unable to keep up with the rate at which messages are being produced. It contains different ActiveMQ topologies which can be used effectively to meet volume throughput in addition to various parameters to tune ActiveMQ. I found it extremely useful. The following XML snippet is taken from configuration activemq.xml. The values specified for memoryUsage, storeUsage and tempUsage are for discussion purposes only. 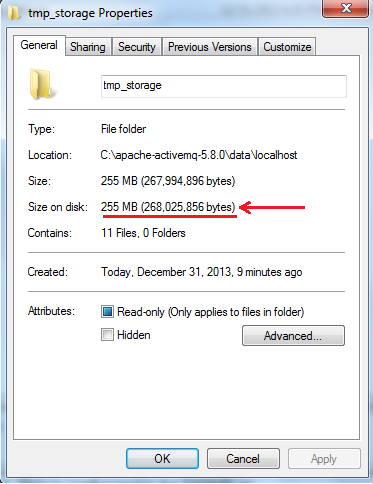 256MB of JVM memory is available for the broker. Not to be confused with -Xmx parameter. Broker availability is critical for message infrastructure. Hence producer flow control is a protection mechanism that prevents a runaway producer from pumping non-persistent messages into a destination when there are no consumers or when consumer(s) is unable to keep up with the rate at which messages are being produced into the destination. ActiveMQ provides mechanism to tune memory usage per destination. Here we have a generic policy for all queues where producer flow control is enabled and destination memory limit is 100MB (again this is only for illustration purposes). 265,025,856/(256*1024*1024) * 100 = 99.8 ~ 100% as shown in the broker console. Consider the following system usage configuration. We have reduced tempUsage to 50MB while keeping the same destination level policy. temp_storage stops growing at close to 96MB and producer hangs..
Temp percent usage is 191% because (95.5MB / 50 MB)*100 where 95.5 MB is size of the folder and 50MB is temp usage limit. 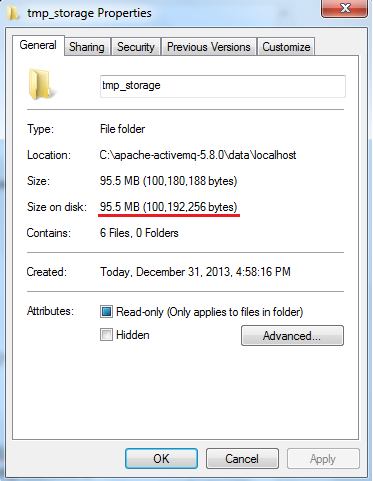 The destination has a limit of 100MB so the temp_storage didn't grow past it. It is sort of confusing which is caused by the fact that temp usage limit is less that per destination memory limit. Let’s repeat the same test with persistent messages. Let's produce 1MB persistent messages into a queue named "foo.bar"
Broker store usage is 100% as shown below. 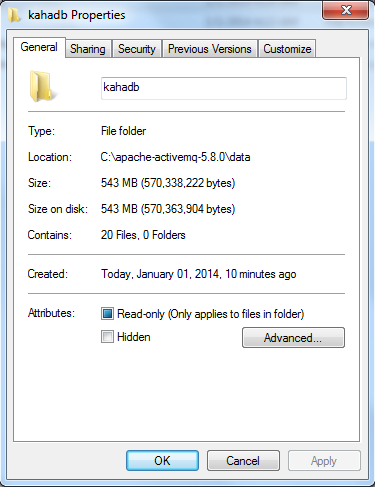 Since the messages are persistent, they need to be saved onto the file system. Store usage limit is 512MB. In the above example, the memory usage percentage is 11. How did that come about? As per the destination policy, the memory allocated per destination is 100MB and the cursorMemoryHighWaterMark is specified to be 30. So 30% of 100MB is 30MB. Hence 30MB is used to store messages in memory for faster processing in addition to be being stored in the KahaDB. .
Memory usage is the amount of memory used by the broker for storing messages. Many a times, this can become a bottleneck as once this space is full, the broker will stall the producers. There are trade-offs between fast processing and effective memory management. If we keep more messages in memory, the processing is faster. However the memory consumption will be very high. On the contrary, if messages are kept on the disk then processing will become slow. We have seen in this blog how store, temp and memory usage work in ActiveMQ. % of store and temp usage cannot be configured per destination while % of memory usage can be because of cursorMemoryHighWaterMark. Hope you found this information useful. The examples given here are for explanation purposes only and not meant to be production ready. You will need to do proper capacity planning and determine your broker topology for optimal configuration. Feel free to reach out if any comments! how much this changed in ActiveMQ 5.9.0? I can not find cursorMemoryHighWaterMark for example in the configuration.